...to The Real Saint Nick? There are many legends about this shy, poor little rich boy. Historians say he was orphaned at an early age when his parents died of the plague in the 4th century in Patara, Turkey. 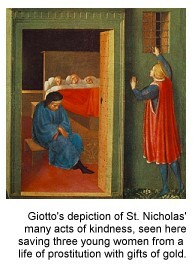 Soon after, Nicholas was sent to live with his uncle, an abbot in a nearby monastery. Impressed by his uncle's teachings, and determined to live the life of a good man, he vowed to use the money inherited from his wealthy parents to help others. Later he was ordained a priest, and when the bishop of his district died, he was made Bishop of Myra. An early act of kindness attributed to him was the legendary rescue of three young women from slavery and degradation. Their father had no money for a wedding dowry - and was about to sell them into prostitution - when bags of gold, one for each sister, mysteriously appeared over three successive nights (some legends have St. Nicholas secretly throwing it down the chimney). As the stories about Good St. Nick grew over the centuries, the gold in the legend was later represented by three spheres, a symbol that appeared outside hock shops throughout Europe after pawnbrokers adopted St. Nicholas as their patron saint. Today, no other saint has become as universally known and loved. He is honored as a saint by the Protestant Churches, Roman Catholicism, and Greek and Russian Orthodoxy. In the sixth century, Emperor Justinian I built a church in his honour at Constantinople. In 991 A. D. he was revered in Germany by Otto II - influenced by his wife, a Greek Orthodox. In 1087, the bones of St. Nicholas were given a final resting place in Bari, Italy around which the Italians built an entire basilica. Throughout Europe hundreds of medieval churches were named for him. As well as being the patron saint of children, pawnbrokers and unwed girls, Good St. Nick is also said to watch over bakers, barrel makers, boot blacks, brewers, dock workers, druggists, fishermen, judges, newlyweds, old maids, paupers, pilgrims, sailors, scholars, students and travellers. Greece and Russia both claim him as a protector, along with places as far afield as Portsmouth, England to the isle of Sicily. Although obscured by reindeer, elves, and department storecloseouts, behind the legend of St. Nicholas is a kind and self-effacing man who loved and cared for those in need, especially children.